TE3N is the kind of film that bores first and frustrates later, complains Raja Sen. There are things TE3N gets charmingly right. It starts with a moment straight out of Gol Maal, set at a police station, an affectionate tribute to kick things off, serving also as a sobering reminder that Amitabh Bachchan, once the lanky lead (or lead's closest friend) in sparkling Hrishikesh Mukherjee comedies, is now (much) older than Utpal Dutt was when he filmed that immortal scene with Keshto Mukherjee. While on actors and aging, the film also features Bengali veteran Sabyasachi Chakrabarty, who memorably played Feluda in Sandip Ray's films. True to form, in the one scene where Chakrabarty smokes, his cigarette of choice, like the famously loyal sleuth, is a Charminar. Age -- and, indeed, time -- are important parts of director Ribhu Dasgupta's narrative in his confoundingly titled thriller, and Bachchan is the ideal choice for the part of an inconsolable grandfather, doggedly desperate to find out about a long-ago kidnapping that led to his granddaughter's death. The actor shuffles through both bewilderment and clarity, everything a struggle for his John Biswas, from starting a scooter to remembering the name of the soup he's making. He's terrific in the part, evocative and righteous and overreaching for the truth but alas, Dasgupta seems too smitten with Bachchan to get a move on and tell the story. A remake of the Korean thriller Montage, Te3n unfolds its dramatic plot -- too sluggishly -- but this isn't too bad until we hit the climax, after which the film's makers are too obsessed with Bachchan (and his reactions to the climax, and its twist) to let the story work. One of the most exasperating things about Hindi movies are their over-reliance on flashbacks, their need to spoon-feed audiences by reminding them of something they saw 10 minutes ago, and the last half-hour of Te3n goes on interminably, recapping the entire film as if to show us how clever they've been. Tragically, however, they haven't been clever at all. It's difficult not to predict the film's twist, and -- the fundamental problem in films that hinge too critically on that massive twist -- when that doesn't fall into place, the whole house of cards collapses to the ground. Bachchan, as said, plays John The Victim, a grieving-bereaving role uncannily similar to the one he played in Wazir mere months ago. Nawazuddin Siddiqui plays Father Martin, a former policeman (now a short-sleeved clergyman) who happens to be John's confidante. This, it must be said, is not Siddiqui at his brightest. The actor, perhaps in a bid to create a coldly efficient character, plays his part too drily to be as compelling as the film demands, and -- worse still -- delivers unfunny lines with the air of a comic waiting for a laugh. He is completely shown up by the reliably effective Vidya Balan who, with one disbelieving mention of his name, dangling question mark raised at the end like an eyebrow, brings alive character and context immediately. "Father Martin?" And, of course, by Bachchan, who exposes Siddiqui's sloppy accent work; as the younger actor stumbles over 'Ripon Sitreet' in the most un-Bengali fashion, the veteran expertly drops in subtle touches like saying 'kidnapar' as only Bengalis could. Not for him the clichéd overdoing of Os. Cinematographer Tushar Kanti Ray shoots Calcutta beautifully, even if the production design is more than a tad on the nose, with clusters of framed vintage photographs better suited to the backdrop to tony Bandra eateries trying to appear old-world instead of just a wall in John Biswas' house. Still, producer Sujoy Ghosh ensures that there is at least an aesthetic in place and the film is competently crafted even if it squanders its narrative potential. Overall, like the Calcutta police station that features a library of audio cassettes full of ransom demands -- a shelf of kidnapper mixtapes, if you will -- TE3N feels like it was put together by people who didn't know where things should go. 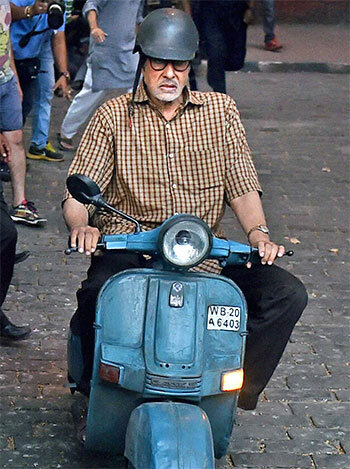 Amitabh Bachchan is excellent, no question. Ah, if only his mystery involved an elusive bottle of Isabgol.